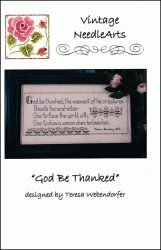 God Be Thanked [G1445] - $9.00 : Yarn Tree, Your wholesale source for cross stitch supplies. A cross stitch pattern from Vintage NeedleArts. "God be thanked, the meanest of his creatures boasts two soul-sides- one to face the world with, one to show a woman when he loves her," Robert Browning. This saying is stitched in the middle of the design, with a row of precious pink flowers in the shape of hearts stitched next to it, as well as below it. Looking for a new piece to stitch for your family room or dining room? What a beautiful addition, this design would be! Stitch count is 225W x 85H.